Aries woman and Cancer man couple is difficult to reconcile, because these people are completely different and in terms of their views on life and character. And often, even like each other, they are afraid to come closer than just a friendly relationship. However, if this couple decides to join the union, then more than weighty circumstances will be needed for this. Most often they marry either in their early youth, when the difference in the characters is not noticeable, or already at the age of mature, when both have already settled and calmed down. When both already understand how to better conduct themselves with this partner, so as not to offend neither him nor himself. Since both do not like boring life and routine, they can accept the difference in characters as a way to better know a loved one. At the same time, they can not even imagine what difficulties they will have to face along this path, how much experience these two will bring to this union. The woman of Aries likes Cancer with her brightness, charm, fresh thoughts and unordinary thinking. Such a woman, Cancer thinks, will help him brighten up his boring everyday life. At the same time, Cancer wants a family, children, a cozy, comfortable home and believes that with this woman he will have a holiday every day. 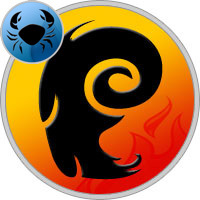 A woman, Aries, is careful not to immediately associate with Cancer, since she likes entertainment, likes to be surrounded by fans who give her various signs of attention. She believes that an alliance with a secret, restrained Cancer will interfere with all that makes up her life. But Cancer is persistent, he constantly lets her know that it does not matter to him who will be the leader in their family, who owns the first word. He always lets her know that she can be herself, that he just loves her. Therefore, she gradually begins to understand what can be with this man natural and that it is with him that she finally feels like a real woman. Thus, patience and courtship and the gentle, reverent attitude of Cancer will not completely convince her that this is what she needs. Over time, they will rub against each other, understand that a good relationship to each other, understanding and trust of a partner can really achieve great happiness and become a strong and happy family. The stars promise this couple a long and happy marriage and strong love. Compatibility Aries and Cancer is a complex alliance, each partner in it plays a role that is not peculiar to it. More unhappy in this partnership feels like Cancer, but the first woman-Aries leaves. This pair has very large discrepancies in many spheres and areas of life. Especially serious are the contradictions in ideological attitudes, beliefs and outlook. As a rule, Aries always and constantly attract to their weaker creatures, including the Cancer, who, like stray kittens, would like to get a little warm at this home, enjoy kissing kisses and actually experience the fire Martian temperament of Aries. But, unfortunately, the opposite traits of character and temper do not contribute, do not allow to enter the state of "soul in the soul." Cancers, as a rule, always and always are in eternal captivity of their own feelings, go on about their mood of spirit and constantly changing moods. Aries for the Cancer are the real purgatory of the soul. With his fire, temperament, he erodes and expels from Cancer all his conserved complex feelings. But as soon as Aries begins to show its distinctive features more vividly and impressively, demonstrating their hidden habits more clearly, as immediately as Cancer, like a snail, hides in its shell and all communication with Aries is interrupted for some period. In the compatibility of the Aries woman and the Cancer man, harmony is possible when the woman consciously directs her strength and activity toward women’s goals and becomes an active hostess, guardian of the home and an overactive mother. Prior to marriage, the romantic relations between Aries and Cancer are complex and in many ways are based on the external attractiveness of partners for each other. In the period of romantic relations, the couple Aries and Cancer are far from perfect. There are couples who come to an ideal state quickly, almost at the time of dating. Aries and Cancer need time to build a harmonious relationship. Therefore, we can speak of an ideal union only in relation to the married couples of the Aries woman and the Cancer man. It is also worth noting that only the woman Aries will be able to build a harmonious relationship with Cancer, which will choose the warmth of the hearth instead of career growth, which is as temperamental and bold as all Aries, but who are interested not in adventure, passion or career, a life. She invests in her all the forces. An efficient, thrifty man-Cancer and an energetic woman-Aries set a goal for well-being and prosperity, and together they are sure to achieve this. For prying eyes the couple looks well-off and assertive, and the power in it entirely belongs to Aries. This couple is not liked by friends, and loves relatives. With outsiders, Cancer is closed, and Aries reacts aggressively if it seems to hurt her husband or family. But with the relatives Cancer opens, resting soul, and Aries becomes that sincere and cheerful woman, what she, in general, is. Then, in this union, Cancer gets a welcome home cosiness and a woman who has a lot of energy to organize life. If the woman-Aries chooses self-fulfillment in career, communication or social life, the union with Cancer is doomed to an early ending. An exception can only be a married Cancer and a woman-Aries as a mistress, when she does not seek to separate the family and become a wife. Such a relationship can last for years — until Cancer does not bore her. If the woman-Aries seeks to create a family and maintain the warmth of the hearth, then she must accept the caution and circumspection of Cancer. It will not be easy, as she goes to people with an open mind, and Cancer will keep her from communication and risky pursuits, manipulating with the help of resentment, silence and emotional pressure. In marriage, the complexity will also be that Cancer is the absolute leader in the family, and the woman-Aries does not know how to obey and often there will be disagreement between them on small domestic issues. According to the compatibility of horoscope Aries-Cancer, if the woman-Aries chose a man-Cancer as her companions, then it is necessary to adapt to such traits of his character as caution and isolation. You should not even try to remake it, but it is, in general, it is not necessary, so open and open with all the Cancer is unlikely to become her later. At the same time, Cancer is very jealous of Aries’ excessive sociability, but if Aries woman becomes more communicating with his friends and especially with relatives, Cancer will appreciate this highly. And this applies not only to parents (although my mother is not the first place here), but also those who are called "the seventh water on the jelly", and there are a lot of such people among them and probably there will be interesting people. Your openness and sociability in relation to family members Cancer will only welcome. If the quarrels with Cancer began on everyday matters, do not be upset. Strange as it may seem, this is even good. If your Cancer gives you all the home power, it will say that he is ripe for treason. He will be a good boy at home, and will sell a man’s energy with another woman. Better let him delve into all the domestic matters and feels himself involved in them, especially since Cancer initially has this desire. And, of course, do not forget to give in — there are a lot of things to do in the house, so that you also find where to put your strength. Also, it is worth remembering that the Cancer man, as a rule, does not need great passions. It requires and needs harmony of feelings, harmony of communication. He loves his home heartily. As a vital bread, it needs and needs moments of seclusion and seclusion, moments for calm inner contemplation. But Aries stands out of the house and is absent, as immediately there is anxiety, emotional anxiety. And, on the contrary, with his arrival Cancer immediately comes alive, becomes cheerful and affectionate, gentle and good-natured, cordial and sincere. Cancer, while loves solitude, peace, but long can not remain alone. He needs the presence of a strong and strong, intelligent and fearless partner, which is his Aries. These two dissimilar requirements of Cancer are so contradictory that in the end they give rise to a strong inner tension of feelings. From the prudence, humanity and restraint of Aries will depend on the well-being of this marriage union between both partners.